No. 4. Hannibal Lecter from The Silence of the Lambs. This film won the four main Oscars back in 1991 (picture, director, actor, actress) and for good reason. 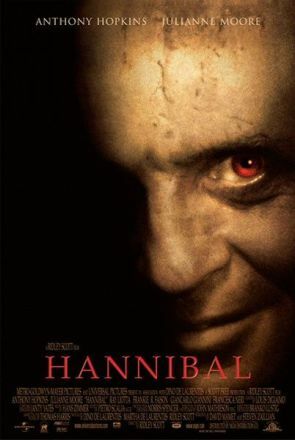 It really is quite an incredible feat, and though I learned recently that Anthony Hopkins’ bone-chilling/likeable/repulsive performance as Hannibal “the Cannibal” Lecter takes up a mere 27 minutes of the film (not sure if that counts the whole end credits sequence where he’s walking away from the camera) the whole movie essentially centers around him. The overall plot is really nothing you don’t see every week on Law and Order, CSI, and every other crime show on TV. Basically, rookie FBI agent Clarice Starling (Jodie Foster) tracks a serial killer with the help of a former serial killer. And in the end she catches him. Shocker. The real fascination obviously comes from her relationship with Lecter. Initially, the filmmakers were looking to cast Robert DeNiro or another such actor in the role. I think that would’ve been terrible (as much as I love DeNiro) because then he might’ve seemed imposing. Instead, when we first turn that corner (the camera in the film often shows us Clarice’s point of view, thus making ordinary scenes more intimidating and Hannibal’s subtle seduction all the more potent) we see an unassuming little man, who’s maybe a little creepy, staring at us. He seems a bit quirky, but certainly no one that would get together for pot lucks at Jeffrey Dahmer’s house (there’s a scary thought). Until he starts talking of course, at which point you feel the almost overwhelming desire to cling to your mother and a stuffed animal (apologies to mom for that fright-filled Tuesday night). However, as the film moves along, Hannibal slowly seduces Clarice and the audience along with her, often with his face filling up the entire camera, looking right at you. His voice is still about the creepiest thing you’ve ever heard, and yet you’re fascinated by him. So what do we think of this man? Well, he eats people, so that’s pretty messed up. But you know what? The man is brilliant. If he applied his mind to solving crimes he’d give Batman a run for his money. Hannibal knows exactly who the killer is for the entire movie, but he makes Clarice guess the whole time. Is this to feel power over her? To help her learn? Both, neither? The answer remains unknown, because who would be smart enough to figure Hannibal out aside from Hannibal himself? In a different time, Hannibal might have been on par with the general of the same name, or even Caesar. But that was another life, and in today’s civilized world he is simply a monster. So how did he turn out to be a sociopath? Well his incredibly disturbing (and thus not printed here) origins are explored in the (interesting but not great) 2007 film Hannibal Rising, from which we can summarize that he had a traumatic childhood. Mix that with a sense of rampant narcissism and you’ve got yourself a serial killer. As explained in the (excellent, almost as good as Silence) film Red Dragon which actually takes place prior to this story, he only kills people that he “thinks are boring.” Here’s where his character becomes especially fascinating, don’t we kind of see his basic point? Though 99.9 percent of us are certainly not deranged enough to kill people who we feel are hindrances to society, don’t we find ourselves thinking that maybe we’d be better off without them? This is the essential dilemma we come to with the Joker (a character who sadly will not be on my list, but only because in the future I’ll be writing a whole rundown about his character being the mirror image of Batman, along with some other inane ramblings about the Batman rogues gallery), isn’t a lot of what the Joker says true? This is what makes villains so appealing: We could become them easily. For instance, I myself tend to be quite narcissistic at times (hence the mostly tongue-in-cheek title of my blog) and it’s possible that very little is stopping me from being like The Riddler (who enjoys exploiting the fact that he’s smarter than other people). So though we should condemn Hannibal’s actions, let’s remember how much like the rest of us he is, even if we don’t want to admit it. On a side note, though I feel that the film Hannibal isn’t a terrible movie, it’s not particularly good either. Because it makes Hannibal out to be less of a disturbed psychiatrist and more of a superhuman Dracula-esque dude (his coat whooshes kinda like Batman’s in one scene, he saves Clarice from the bad guys in the end, it’s all a bit ridiculous. Plus lots of the movie is unnecessarily gross, whereas Silence thrives on understated violence). Okay, back to the analysis. 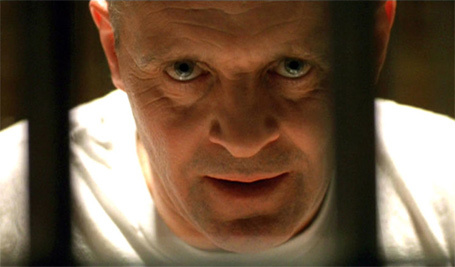 Throughout the film, Hannibal is really the only reason Clarice solves the case. His distorted tutelage led to the saving of lives (though his motives were obviously his own it’s still an interesting note). And he really does genuinely care about Clarice, possibly because he’s in love with her, possibly because he respects her, possibly because she reminds him of someone from years past, it’s never really discussed (nor should it be). Well I think there’s a second category of good villains: people who know how bad they are, and want to prove that everyone else is the same way. Because then they won’t have to hate themselves so much. And that is why Hannibal Lecter made not only my list of villains, but everyone else’s too. He’s a dark reflection of our own psyches. He shows us that in reality, you’re just a third-degree burn away from being Two Face, a vat of acid away from being the Joker, and an unfortunate surname away from being Dr. Doom. And it is only through this recognition that the Batmen of the world can ever rise above their inner darkness to become heroes. P.S. For those of you finding yourselves terribly depressed or disturbed after reading about my first two villains, it just means you’re still human. But fear not, I’ll give you another jaunty entry before too long. We dare you to find a television show or movie that Domenic has not seen and most of them he owns. For this reason he has become a walking encyclopedia of anything you would want to know on the topics of TV and movies. When he's not watching flicks, he's writing screenplays. Stay tuned for those. Contact the author.